Apartments in Phuket from the beach inexpensive. Two bedrooms, one with king size bed and another with 2 single.. modern furniture: tables, cabinets. Living room with plush sofa and armchairs, plasma TV, coffee table. All are beautifully designed, decorated, paintings, vases. Equipped kitchen: kitchen set, electric oven, extractor, kettle, crockery. A dining table with chairs.2 bathrooms with new fixtures. Apartments in Phuket near the beach. Two large communal pools with sun loungers and parasols, beautiful, well-groomed green territory. There is a gym. the price includes: cable TV, Wi-fi, final cleaning. 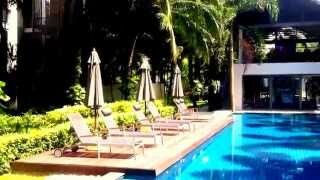 Apartments in Phuket at Bangtao beach inexpensive with two pools, a gym and a fully equipped kitchen. Cleaning is included in the price. To Bang Tao beach - 500 meters - 7 minutes on foot.